Horse and carriage rides, sleigh rides, hay and wagon rides. 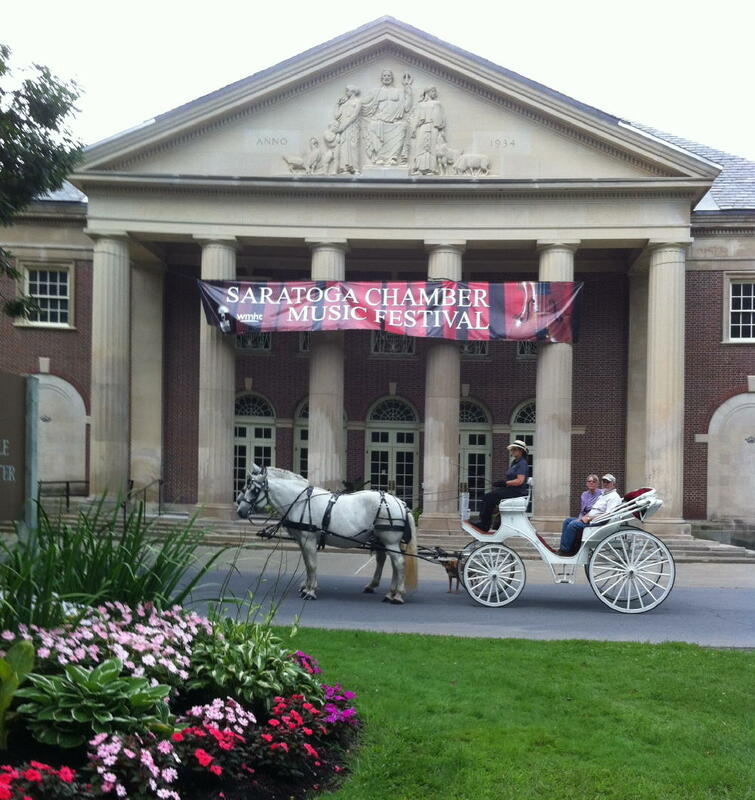 Looking for fun things to do in Saratoga Springs? 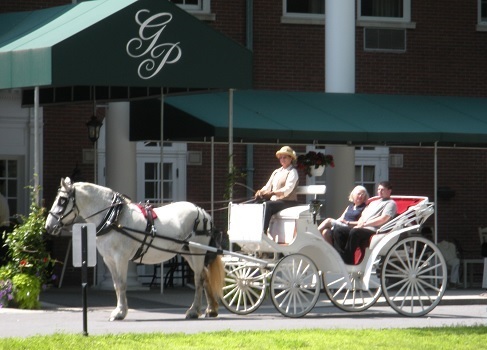 Private Horse and Carriage Rides in Saratoga Spa State Park or minutes away in Greenfield Center ! Custom Rides for Your Event or At Your Location Also Available. Country Lodging for You and Your Horse! Couples, Take a Relaxing and Romantic Carriage Ride in a Classic, Horse Drawn, Victoria Phaeton, or the Whole Family Can Enjoy a Carriage Ride in an Elegant French Vis-à-vis or Comfy Wagonette! By reservation only. The Geyser Loop Ride travels through the natural, wooded section of the park through some of the extensive bird conservation area. Your carriage can stop at a mineral spring so you can taste the famous Saratoga mineral water, famously known as "the cure", and also at the Island Spouter where you can get out of the carriage for a great photo op if you'd like! Ride in style on the Avenue of the Pines Ride just as past presidents, movie stars and even infamous mobsters did when visiting Saratoga Springs years ago. View the impressive facades of the Spa Little Theater, the Hall of Springs, the Lincoln Bath, the National Museum of Dance & Hall of Fame, and the Automobile Museum which is in the building that was originally the bottling plant where Saratoga's mineral water, promoted as "the cure", was bottled. 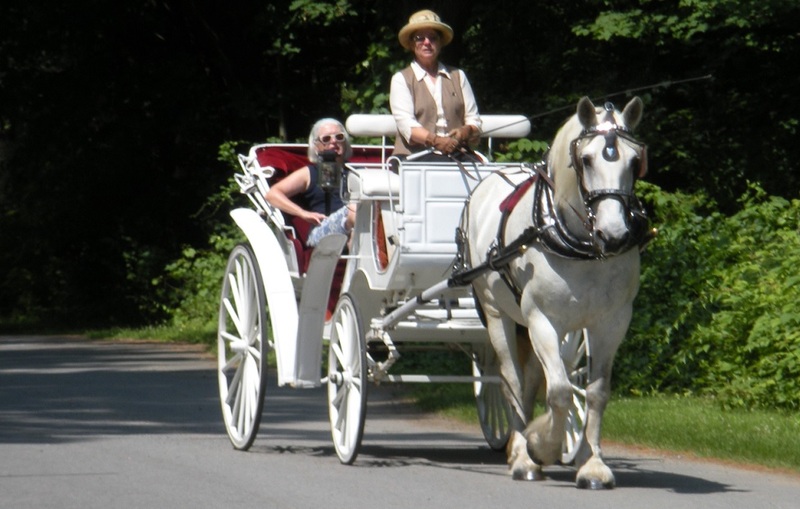 Meet the carriage by the Little Theater on 19 Roosevelt Drive, The Roosevelt Baths & Spa, at the Gideon Putnam Hotel or Catherine's in the Park restaurant and take a private and relaxing carriage ride through the Park! The Saratoga Spa State Park, one of New York's oldest and most famous parks, is distinguished by its classical architecture, several natural mineral springs and is listed as a National Historical Landmark. Other & Larger carriages for families and groups available. Call for ride options and pricing. $200 for two, $250 for four. Please call us at 518-893-6116 to make your reservation! 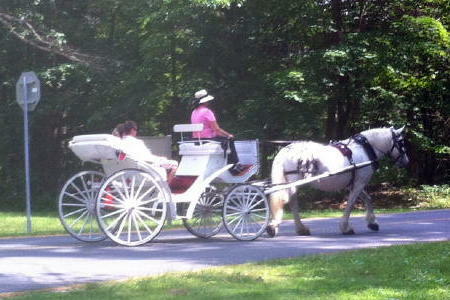 Loon Meadow Farm is pleased to offer private carriage rides in Greenfield Center, year around. Just minutes from downtown Saratoga Springs or Northway exits 13N, 15 or 16, the ride begins at our stable yard and brings you on a relaxing excursion along country roads, away from the bustle and crowds. The ride is approximately one hour long and by reservation only. $160 for two, $250 for four. 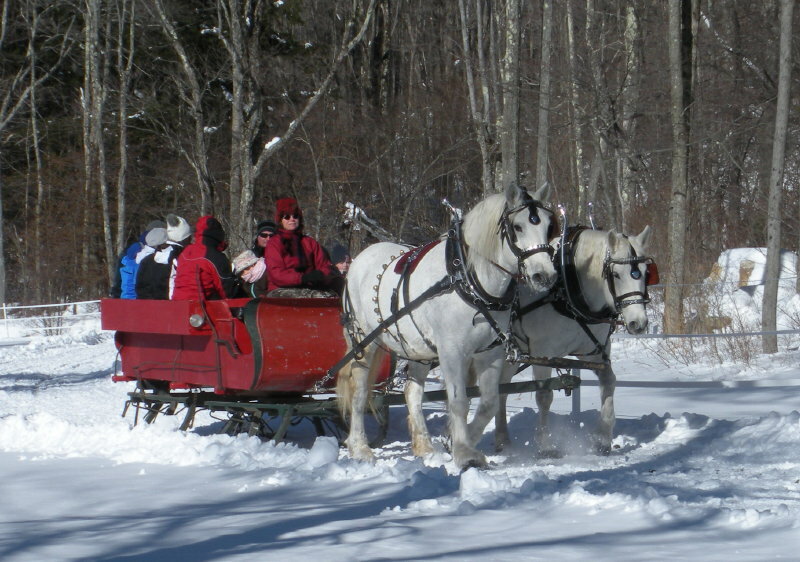 Stay & Sleigh Ride Package! During the winter months, with adequate snow and freezing conditions, we offer horse drawn sleigh rides on our farm, with hot mulled cider afterwards. The ride is approximately 45 minutes long and by reservation only. 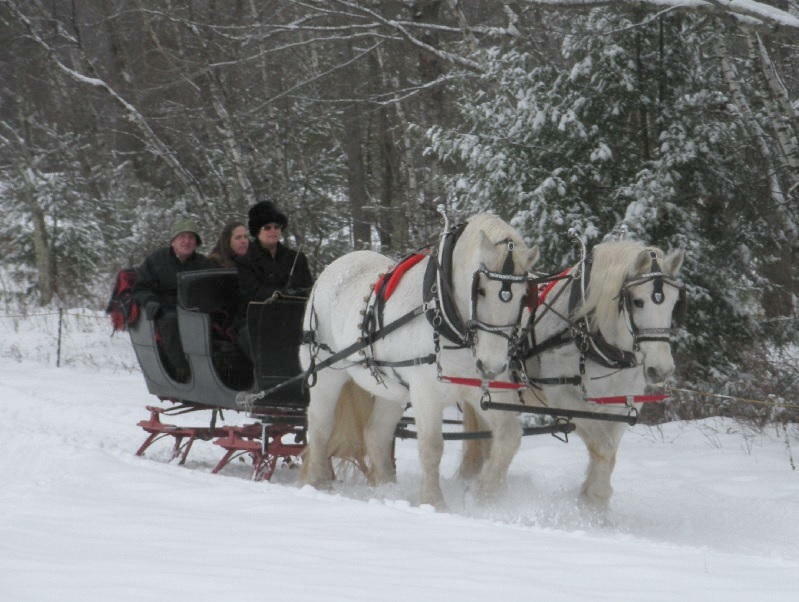 Bookings are made with the understanding that should conditions being unsuitable for a reserved sleigh ride, a carriage ride will be substituted. Saratoga spring water is equal to Europe's finest, bottled from the same source since 1872. Saratoga's cobalt glass bottle is a work of art and, according to the company, the water is mostly distinctive for what it does not have: negligible Calcium, Sodium, Fluoride, Magnesium and a zero Nitrate level. "For the finest presentation of a US mineral water, there is nothing to compare with the legendary Saratoga."